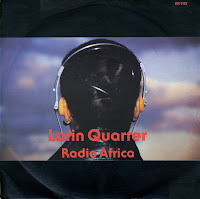 Latin Quarter formed in the early Eighties. The line-up changed through the years, but in their 1986 heyday it was Steve Skaith, Richard Wright, Michael Jones, Greg Harewood, Yona Dunsford, Carole Douet, Martin Lascelles and Dave Charles. Their biggest hit was 'Radio Africa' (1985), which was shown regularly on music television channels like Sky Channel and Music Box during that time. It peaked at number 19 in the UK singles chart in February 1986. It reached the Dutch Top 40 a couple of months earlier, peaking at number 37 in October 1985.